And we're off!! 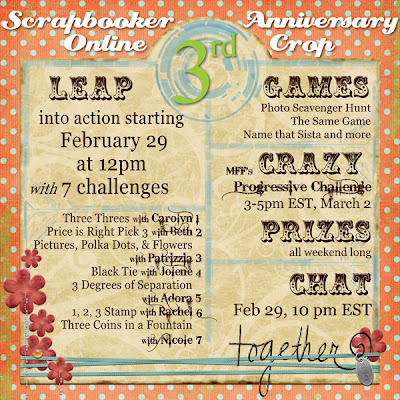 The 3rd Anniversary Crop fun has started over at Scrapbooker Online. Join us in the Crop Forum for all the challenges, games and fun. There's also a chat tonight at 10 PM EST for anyone who wants to talk scrap with the SBO sistas. All projects for the crop are due by 8 PM EST on Sunday March 2nd. Hope to see you there! Quick post today: I just LOVE the new Making Memories 5th Ave. Sophia collection! I made this card for Di Hickman's blog this week. You can see details here. Lots to share today! It's our last XO Love challenge at Caardvarks today. 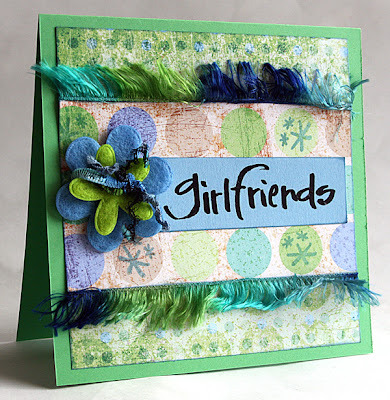 Create a Friendship card and link it back to 'Varks for a chance to win a stamp set from Queen Kat Designs and a Caard prize pack. I had a great time making the card above. Who knew that papers from the dollar store could make a card look so good? I also love the two types of fibers, especially the can-can fringe. Thanks to my buddy Carolyn for those! Details for the card can be found here. I made this layout based on a PageMaps sketch by Becky Fleck. Ian was the lucky recipient of lots of Valentines, mostly from family members and some sistas at SBO, at his school party last week. This sketch is for the February contest at Basically Scrapbooking. Details for this layout are here. 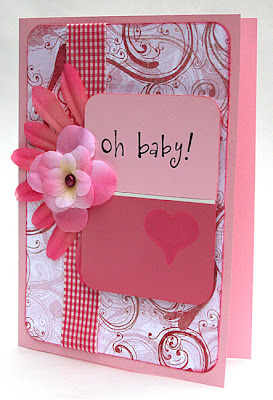 It's Wicked Awesome Thursday (WAT) at Scrapbooker Online which means Design Team uploads! I made this layout of Matthew using WorldWin Treasures textured cardstock and just a few other supplies. I have to admit that this layout feels positively NAKED to me, but I have gotten lots of nice comments on it so far. You can see the details here. 1. My favorite ice cream is Heavenly Hash which most stores now call Rocky Road. 3. My hair requires conditioner every day. 4. My in laws now live 6 miles away. What a blessing to have family so close! 5. I gave up chocolate for Lent. 6. I frequently refer to my two boys as "monkeys." So at the risk of losing their friendship, I am tagging: Carolyn, Celeste, Nicole, Gina, Beth, Bety and Leslie. Please don't hate me. 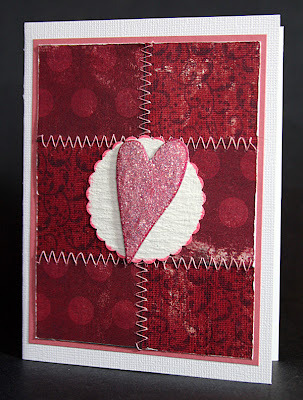 It's funny how I get into a color trend when scrapping or making cards. I will look through my gallery and see definite patterns in color choices for entire projects which are not always dictated by the current season or holiday. Lately I have been dipping into blues, teals and greens. Moody perhaps? With a hubby who travels out of country (LOTS lately!) I can only imagine why. I made this card for today's Di Hickman card sketch. As always, the designers have offered lots of variety for this sketch. I didn't intend for this card to be one for Mother's Day. As I was finishing up I realized that I didn't have that many rub on sentiments that were white! So I guess I got an early start on cards for May. Details for this card can be found here. Our third XO LOVE challenge is up at Caardvarks today! 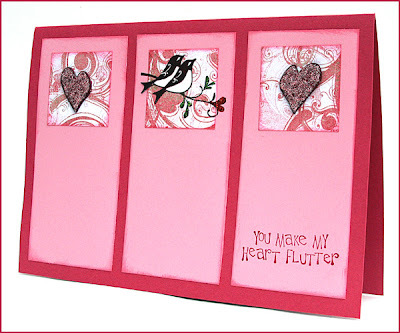 Make an anniversary card and link it up to the 'Varks blog by midnight Eastern on February 21st to be eligible to win a Caardvarks "Staar" kit and a set of Queen Kat Designs Stamps. 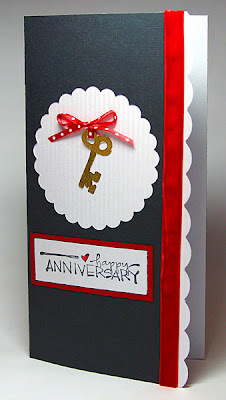 I made this anniversary card using the key stamp from QKD and a little gold embossing. All the details can be found here. What a huge surprise! 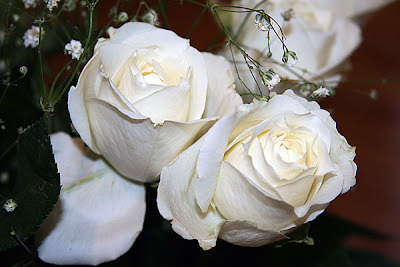 Scott is working in Puerto Rico again this week, and yesterday he sent my absolute favorite flowers for Valentine's Day complete with a tender note. This is the card that I tucked into his suitcase for him to find in Puerto Rico. It uses this week's sketch from Di Hickman's blog. It turned out to be one of my favorite cards ever. And for as many cards as I make, that means something! Details for the card can be found here. He won't be home until very late tonight, but we are having a Valentine dinner with the kids and my inlaws complete with a heart-shaped cake. Have a very special day with someone you love! Leap Into Our Anniversary Crop! It's official! We are celebrating 3 happy years of online scrapping, chatting and shopping at Scrapbooker Online. Join us during the weekend of February 29-March 2 for lots of fun challenges, games and prizes. Special thanks to Rachel for the awesome flyer! 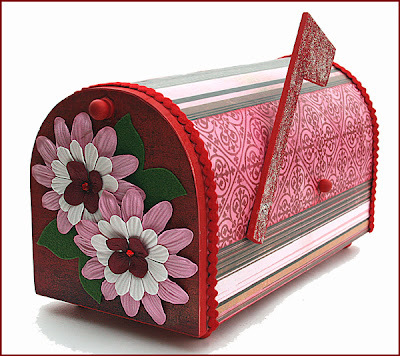 This is my final Valentine mailbox for 2008, I swear! I made a few mini-sized ones for Scrapbook Corner to use as display samples, and I also made larger ones for each of Ian's two homeroom teachers. 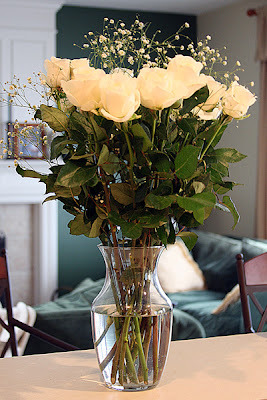 I am excited to see them in use at the Valentine party on Friday afternoon. Click here for project supplies and details. 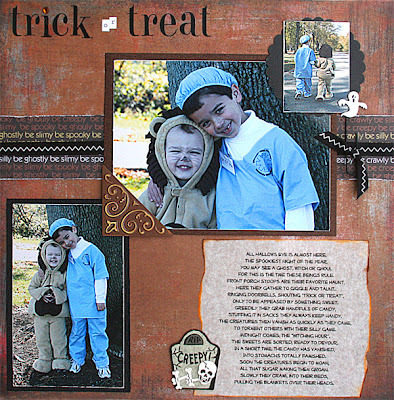 I also made this layout for the PQR challenge at Scrapbooker Online. I had to use a punch, ribbon and a quote. Check out all the fun! You can see the details for this layout here. It's week 2 of challenges at Caardvarks. 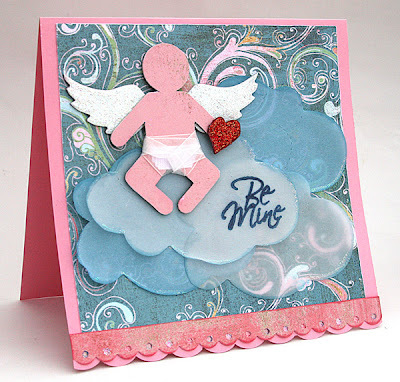 This week we are pouring all the love on BABIES! 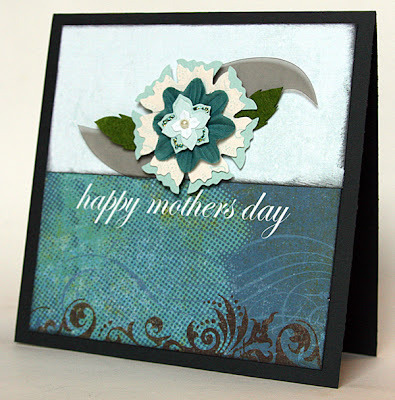 Please link up your card to the comments section at Caardvarks to be entered to win a stamp set from Queen Kat Designs AND a new Caarvarks "Sea" themed Caard kit! The contest is open through midnight Thursday Feb. 14th. Good luck! You can view the supply list for this card here. 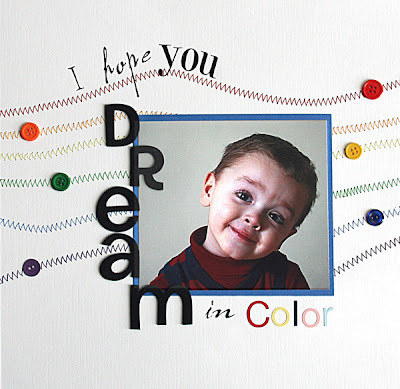 It's Wicked Awesome Thursday at Scrapbooker Online, so that means Design Team uploads! Our sponsor for the entire 2008 calendar year is WorldWin Papers, and this month we are doing a special cardstock-only month featuring their products. 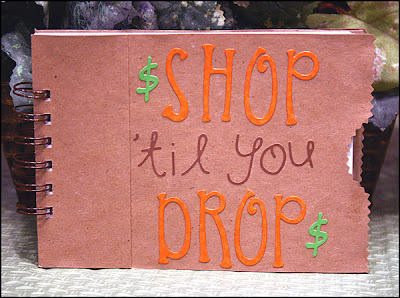 My first project is a shopping list made from one of their kraft cards, Crafty Board chipboard, two kinds of cardstock and my Zutter Bind-It-All. I love how practical this is! Yesterday Di Hickman also released her latest card sketch, so this was my interpretation. I love the distressed look of these My Mind's Eye papers, so I continued the look by roughing up the edges. I punched a scalloped circle from Worldwin ruche paper which has a cool crepe paper texture. 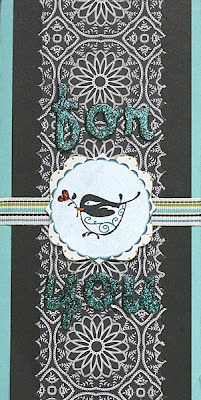 A little grungeboard coated in ink and Stickles was the perfect topper. I am tickled that so many of my DT projects this year turned out to be Valentines. I have to get them in the mail! Ok, pun intended! For the month of February we are asking you to alter a cigar box at (Some) Assembly Required. You can find these little beauties at local cigar shops, often for free. 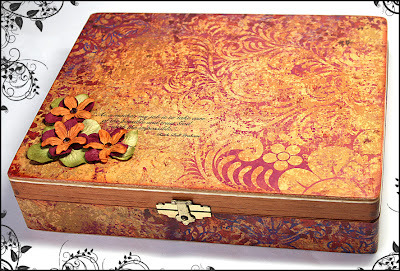 There are other types available at most of the big box craft stores, so check it out. Finished boxes need to be linked back to the SAR blog by Feb. 29th to be entered in the drawing for a fun RAK. This month's prize has lots of goodies to alter including a Maya Road chip album and a band aid tin. Fun stuff! 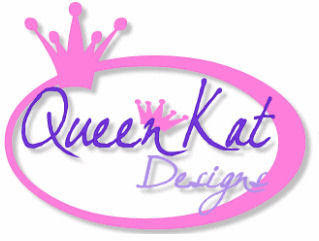 Caardvarks is hosting a whole month of XO Love XO challenges sponsored by Queen Kat Designs. 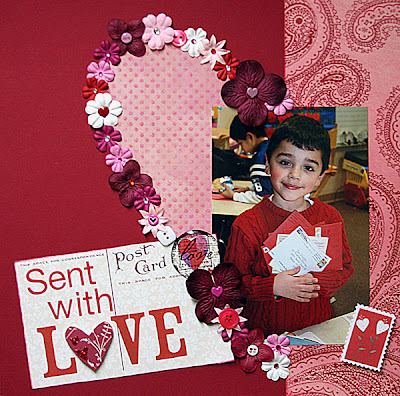 Our first challenge is to create a Valentine! We will be posting new challenges every Friday during the month of February, so check back often. I made this card for my DT work at Basically Scrapbooking using the new Basic Grey Two Scoops line. A full supply list is available here. I also made it in response to a little throwdown from my good buddy, Carolyn, who is celebrating her birthday today.